ucks County Seafood is located in Dublin, PA on Route 313 between Doylestown and Quakertown. We are open six days a week but closed on Mondays. 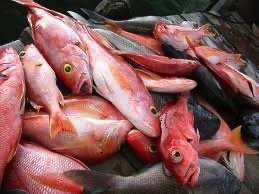 We're proud of our fresh seafood line-up which allows you to feel totally confident when you're purchasing from us. If it's not fresh, we won't sell it. 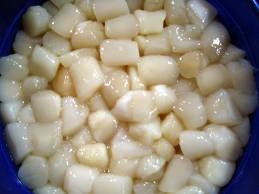 We feature a cooked take-out menu with a great variety of prepared side dishes. All of our soup and salads are homemade right on the premise. Our shrimp trays are prepared only with wild caught shrimp - never farmed. Our live lobsters, hard shell crabs, snow crab legs and king crabs arfe always steamed at no additional charge. We also open our fresh oysters and clams for your convenience. 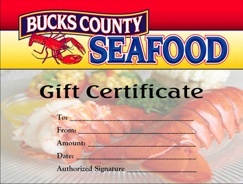 If you are a lover of seafood as we are, we promise you will always be satisfied with any purchase from Bucks County Seafood. A Great and Easy Holidy Gift - Any Denomination.